A few days after the defeat at the Battle of Little Rock, the City of Little Rock ceased operations on September 21, 1863. Planning for this had started in August, which would suggest that civic leaders were none too confident in the ability of Confederate forces to hold on to the city. At the August 24, 1863, City Council meeting it was reported that the City’s funds (presumably Confederate) had been “placed in the hands of a reliable party who is well known to the Council.” The identity of this “reliable party” has never been disclosed. On September 21, the Council met and took three votes. The first was to suspend the operation of City police (which at the time was not an official police force, it was a constable and some volunteers). The second was to suspend the collection of City taxes. The final vote was to adjourn. There is no record of Mayor William Ashley being present at this meeting. Recorder A. J. Smith (the equivalent of City Clerk today) was not present. The minutes were signed by “J. Ash, Deputy.” Records do not indicate if that gentleman was officially Deputy Recorder or if he had simply been deputized to take minutes at the meeting. The five City Council members present were C. P. Bertrand (a former mayor and step-son of Little Rock’s first Mayor, Matthew Cunningham), S. H. Tucker, W. B. Walt, I. A. Henry (would would also serve on the first City Council after the war in 1866), and Lou George. 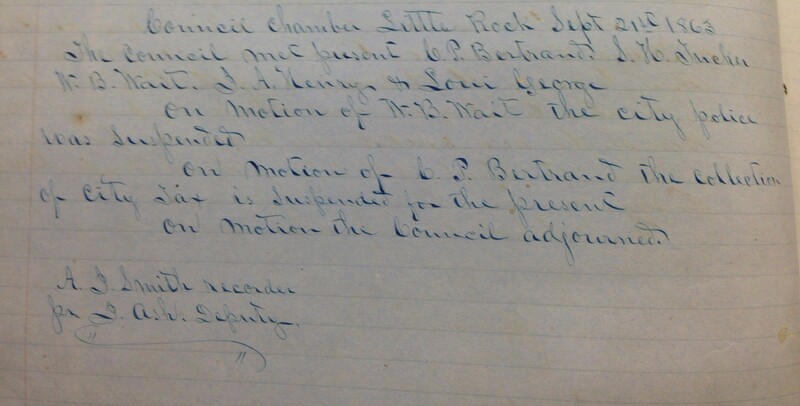 One hundred and fifty years ago this month, Little Rock City Hall resumed functioning after the Civil War. The City government had disbanded in September 1863 after the Battle of Little Rock. From September 1863 through the end of the war (on on through part of Reconstruction), Little Rock was under control of Union forces. Following the Battle of Little Rock, the City of Little Rock ceased operations on September 21, 1863. 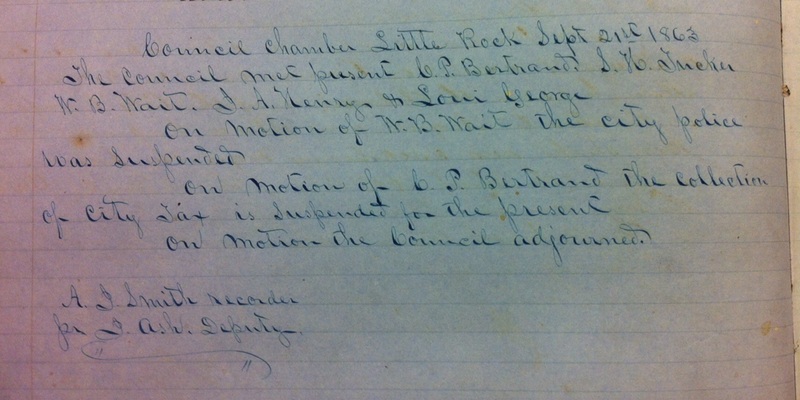 On September 21, 1863, the City of Little Rock government shut down. Following the occupation of Little Rock by federal troops (on September 10, 1863), the city was now under control of the United States Army. The City Council met on September 21 and voted to disband the police force and to suspend the collection of taxes. Mayor William E. Ashley was not present. The five aldermen present were Charles P. Bertrand (a former mayor and stepson of Little Rock’s first mayor Dr. Matthew Cunningham), S. H. Tucker, W. B. Wait, I . A. Henry, and Louis George. Following the actions regarding the police and taxes, the council adjourned. Following the September 21, 1863 meeting, there was not a City Council meeting until January 8, 1866. I. A. Henry, who had been at the final 1863 City Council meeting was also an alderman on January 8, 1866.